David R. Ross, current convenor of the Society of William Wallace, will commemorate the memory of Wallace, by walking from Robroyston near Glasgow, to London, on the 700th anniversary of the actual event. 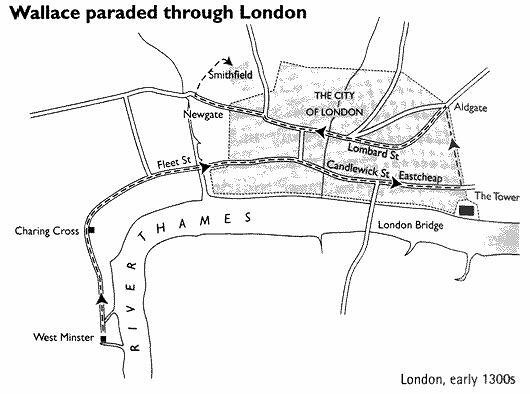 Wallace was captured on the 3rd of August 1305, and arrived in London on the 22nd of that month, the journey taking 19 days. On the 23rd, he was taken to Westminster Hall, the oldest part of the current Houses of Parliament, where his sham trial took place. He was taken outside and tied to the tails of horses to be dragged the 6 miles through the city to his murder at Smithfield. Therefore the same dates in 2005 mark the 700th anniversary. Although David is undertaking the walk to London alone, anyone wishing to join him to walk the route through London that Wallace was dragged, should meet outside Westminster Hall (gate at north side of Houses of Parliament. e.g. opposite side from the river) at noon on 23rd of August 2005. The walk will take approx. 2 hours, arriving at Smithfield around 2 pm, at the monument outside St. Bartholomew s church and hospital to his memory. I do not need to stress the solemnity of this occasion, and what it will mean to Scots, commemorating their national hero, to walk the actual route that was the final chapter of his life. Anyone taking part will show their bond with Wallace, and it will show that they stand with him in their desire for freedom for themselves and their fellow countrymen and women. He died alone and thinking his cause was lost. Let us show him that he is remembered with honour. From the gate leading into Westminster Hall in the Houses of Parliament, turn right (north). Pass Parliament Square and into Parliament Street, which leads north into Whitehall. At Trafalgar Square turn north-east into the Strand. The route continues on through Fleet Street and on into Ludgate Hill. As you enter Ludgate Hill, this is the site of the Ludgate in the wall of the City of London, and where Wallace entered the city proper. At St Paul's Cathedral, you enter a thoroughfare named St Paul's Churchyard. This leads on into Cannon Street. Follow Cannon Street on to The Monument, then on into Eastcheap, continuing into Great Tower Street. You then reach Byward Street, which leads on to Tower Hill. You are now passing the Tower of London. A left turn is taken here, following the edge of the old city boundary, northwards up Minories to the Aldgate, another old gate of the city of London. Turning left here, take a right turn off Aldgate into Leadenhall Street. It was somewhere to the south of here that Wallace had been incarcerated the night before his trial, in the parish of St Gabriel's in Fenchurch Street. From Leadenhall Street continue on into Poultry, then on into Cheapside. This leads on to Newgate Street where Wallace was taken through the 'Newgate' out of the city. Turn right into Giltspur Street, following the side of St Bartholomew's Hospital to West Smithfield at Smithfield Market, and the plaque on the wall of St Barts. I will be leaving the monument to Wallace's capture at Robroyston in Glasgow at 8AM on August 3rd 2005. The route is some 450 miles, and I will arrive in London, at Westminster Hall where Wallace was tried, on 22nd August 2005. On the 23rd August, the 700th anniversary of Wallace's execution ( a Tuesday) I will leave Westminster Hall at noon ( Westminster Hall is the oldest part of the Houses of Parliament, and it was built in the late 1000s - it has not changed since Wallace's day) and walk the route that he was dragged through the streets of England's capital. If people wish to join me for this historic section of Wallace's last hours, then they are more than welcome. The walk will end at the Church of St Bartholomew the Greater, the oldest church in London, and there will be a private, invitation-only commemoration of Wallace, very like a funeral service, starting there at 3pm. This will last about an hour and a half. As St Bartholomew's was the last thing Wallace saw (he was executed in front of this church) it is a fitting place to hold this event. It may have taken Scotland 700 years to hold a funeral service for the man, but we can ensure that after 7 centuries he knows he is not forgotten. There was no-one there for him on the day, and that is a situation that will be rectified in 2005. This will be the mourning that Wallace never had.